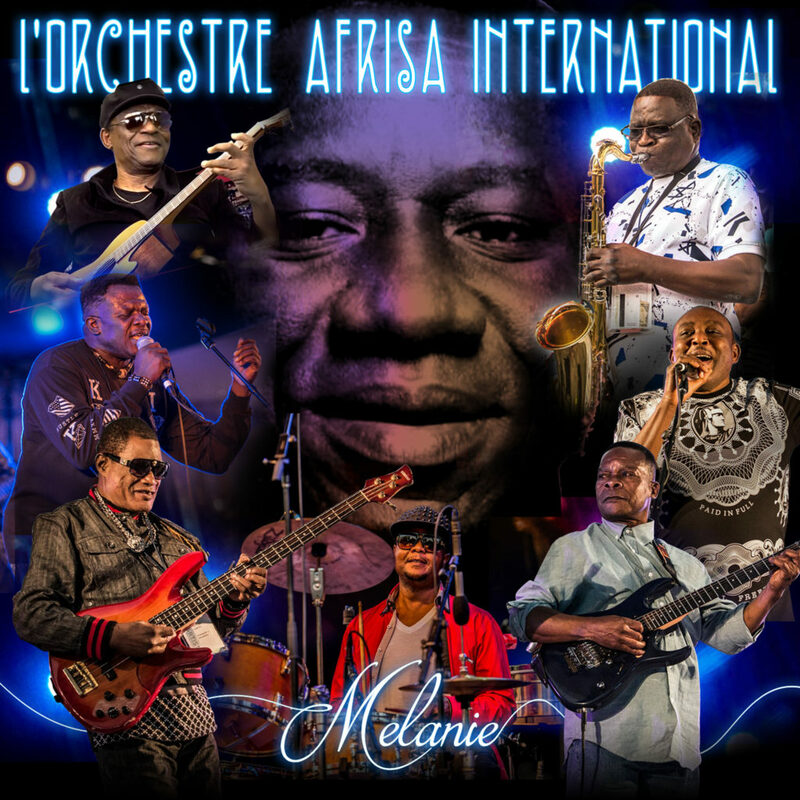 L’Orchestre Afrisa International is one of the most consequential African bands of the 20th century. It was the third major Congolese band to feature vocal legend Tabu Ley Rochereau, but this was the band he led for most of his career, from its founding in 1970 until Tabu Ley’s death in 2013. In the late ‘90s, during the final years of Mobutu Sese Seko’s ruinous reign over the country then known as Zaire, Tabu Ley and Afrisa went into exile in Europe and the United States. After Mobutu fell in 1997, Tabu Ley returned to Kinshasa to become a minister in the government of Laurent Kabila. Through all of this, one man remained at the helm of Afrisa: Modero Mekanisi. In 2017, four years after Tabu Ley’s death, Modero and other surviving members of Afrisa have revamped the band and released a brilliant new album, Melanie. Afropop’s Banning Eyre visited Modero at his home in Seattle in 2015 to discuss the project. Afrisa vocalist Wawali Bonane also lives in Seattle and was present, as was Seattle African music radio veteran Jon Kertzer. Here’s their conversation. 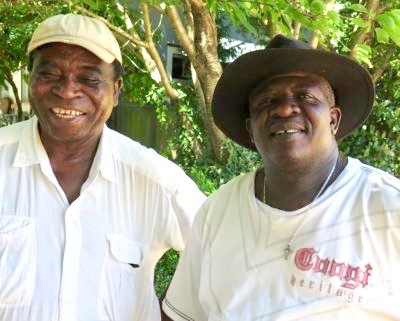 Modero, left, with Afrisa vocalist Wawali Bonane. Photo by Banning Eyre. Banning Eyre: So good to see you again, Modero. We met in Kinshasa on my very first trip to Africa in 1987, during the heyday of Afrisa. So we go back. But for folks who don’t know you, why don’t you introduce yourself? Modero Mekanisi: Thank you. My name is Modero Mekanisi. 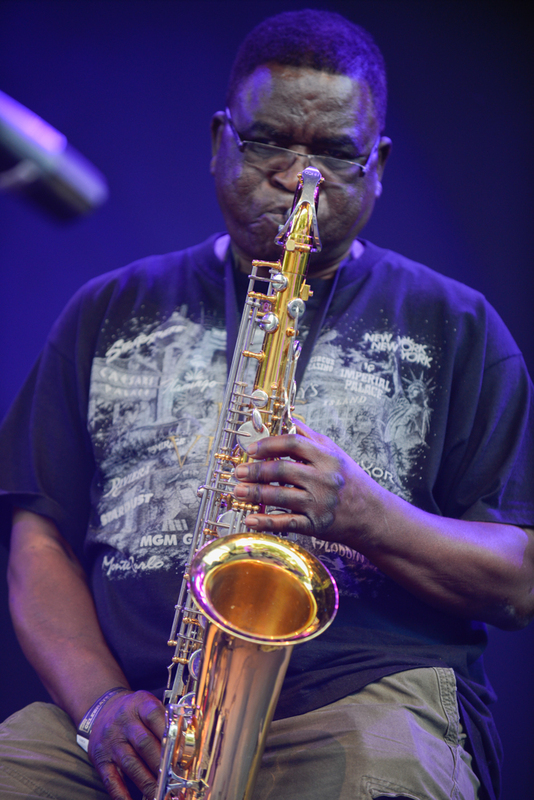 I am a musician, saxophone player, also a songwriter and composer. I am the person who has been here longer than any other musician with Tabu Ley. I have been behind Tabu Ley as the leading person for decades. As Tabu Ley decided, he asked me if he was no longer here, to maintain his style and continue. He didn't want his music to die. And I agreed. I promised to maintain the rumba music of the Congo actually. Let's go back to the early days, starting with you. Where were you born and how did you get into music and this band? I was born in the Congo. I am originally from the first province after Kinshasa, Bandundu, east of Kinshasa. Bandundu is where many musicians who have influenced the music in Kinshasa, whether they were singers or musicians, guitar players or whatever. When I was very young, as a Christian kid, my initiation to music was singing in the church choir. My first interest came from the gentleman who was playing the harmonium at our rehearsals in the church. Later on he was playing piano. So I started training on piano. I studied classical music on piano. The Congo was at a time when you could not find a piano almost anywhere. But my thoughts were always on how I could do music. So I went on to apply for music school, but most of the teachers there, the director, had only one discipline, classical music. But you say there were very few pianos in the Congo then. It was very rare to find a piano. Every church had a harmonium or an organ, but not a piano. If you wanted to see a piano, you had to go to a music school. And that's what happened I went to that music school. I applied for taking lessons. I started with piano, the classical piano but as time was going on, I'll tell you what, one day I was looking at—there was no TV at the time—at a movie in the evening. And I saw Louis Armstrong playing trumpet. I said, "Wow, I like that guy and what he is doing." I wrote in my small copybook that I had to learn a wind instrument like this guy was playing there. So I started learning with the saxophone. About a year would that be? Well, it was 1960 or '61? Beginning of the '60s. It was after independence, because at that time I was still in elementary school and secondary school. No parents would let you go to music school. I was learning only church music when I was younger. For that, the parents were O.K. But if you start to go out of church music, you are not allowed to. And then, when I was ready to get into high school, I was feeling a little bit to be free of these doings. No more influence from my parents. To be honest, I already knew how to read music when I was 7, 8, 9 years old. So when I finished high school, I was already a musician. I started college, and then I dropped out. Because my desire to do the music was stronger than to do any other job. I went to apply for a job at the Bank of the Congo. I started working there in the daytime, but every night I was in the nightclubs trying to see if I could get a chance to play music. So this is what would be your college years in the '60s. What year were you born? And now you're around 20, in Kinshasa going into these clubs, trying to find a way to get in. And I imagine you did find a way to get in. Yeah, I found the place. The guys who are playing music there knew me. They were friends. They asked me what I wanted to do. I said I wanted to be in a band. I wanted to sing foreign music like jazz. I was trying to sing "Mack the Knife,” and songs of Frank Sinatra, Paul Anka. But the problem with the guys there, they were not playing English music style. They were playing European music, mostly French. I was the only one trying to get them to listen to American music: "Mack the Knife," "What A Wonderful World." And people were interested. That was the time when Congo was in trouble, and the United Nations military were all over the country. The understanding of the people, when they talk about the United Nations military, they thought that it was the U.S. Army. That was a big confusion. They called everyone there American soldiers, because the language used by United Nations soldiers was English. So now the audience was bigger coming to listen to Louis Armstrong songs, and Nat King Cole songs, Frank Sinatra—whatever it was. Still, I was unhappy. I said, "Me, I want to play music." Then one day, I brought the saxophone. While I was still trying to sing, I got the saxophone. The guitars were playing. I said, “Let's practice a little bit before we start the night. We started a song that was ‘Figaro.’” [Sings] That was my first song on the stage on saxophone, and that gave me strength to practice more songs. So this is a cover band playing in Kinshasa in the 1960s. These are African musicians, but they're playing European songs? Yes. Italian. British. French. Little bit of United States. They are not playing rumba? Rumba. Yes. Rumba was the routine of every Congolese musician. He played whatever style it was, Caribbean, whatever it was. But at the end, he will want to play rumba. Rumba was the basic music everywhere. And was that what the audience expected? Were they waiting for that? Not the foreign audience. If you're playing in a club downtown in Kinshasa, you play rumba, but just to change the mood. Mostly for a foreign audience, you play the music of America, Great Britain, France... But as a Congolese person, when people go sit down to take a glass of wine or whatever, beer or whiskey, while are they not dancing, you'd still try to play rumba to make people understand that even if you play American, French, Italian, you are still a Congolese musician. You still want to play the rumba. And after the nightclub shows, if you go downtown, there will be only rumba music there. At the time, I was still going and working at the bank, coming back to play music at night. At the end, I was exhausted. So it was tough to go out and play rumba until 4 o'clock in the morning, eh? It was too much for me. I was spending the whole night in the clubs, and early morning to the banks. I had to make a decision. Where was I getting more money? And I said I was getting more money with the music. I decided to drop the bank. And from there, I decided to do 100 percent music. At that time I was not with Tabu Ley yet. I was in many bands. At the time, you could count in Kinshasa on the same night, 200 or more bands playing at the same time. Everywhere. Every area. There were many, many bands in Kinshasa at that time. So I was in a couple of bands. I was playing sometimes for five or six months with one band. Then I left and went with another band, as a horn player. They wanted me everywhere. Then, at the end of ‘69, I decided to go to the Arts Institute in Kinshasa. Because I wanted to get a degree. I wanted to learn international relations and cultural animation. Then in 1970, when I was living there, at the college, I returned to play in the nightclub. And some friends who were already with Tabu Ley came to listen to the music. Somebody had told them that there was a guy who was playing saxophone in the club. “Tabu Ley needs to talk to that guy.” So the musicians came and told me that Tabu Ley wants to see you. I said, "What am I going to do with Tabu Ley?" I was a bandleader too by then. I was comfortable in the place. I didn't have any problem. Tabu Ley was very well known by this time. Oh, he was a superstar. When did that start? When did he become a superstar? Tabu Ley? Me personally, I knew Tabu Ley in 1960, when I was still very young. He was well known, because he was a very good songwriter. Sometimes the big stars like Kabasele were singing Tabu Ley’s songs. So he was known when he was not even in African Jazz yet. I think, I discovered him when I saw him sing the song for his wife, “Adios Tete.” From that time, people were convinced he was a very good singer. [Sings] That! From that time, people knew Tabu Ley was a good singer. So then he entered the African Jazz band with Joseph Kabasele and Dr. Nico. These were some of the big names at the time. The first time Tabu Ley went on the stage was I think June 6, 1959. I think that was the first date when he jumped onto the stage. I still know that, because he finished his high school then. He got the diploma, so he had to make a choice: go work in an office, or become a professional musician, a singer. So he was given an opportunity to sing in African Jazz. That's when the story of Tabu Ley Rochereau started. So he was already a superstar by the end of the '60s. He was already a big star. So you started to work with him as a musician in 1970. Tabu Ley said, "Well, I have been told about you, and I want you to join my band." I said, "Well, I am not so comfortable getting into your band. I want to make sure that I will get what I want from my music—that I will get paid the way I want." Because in the downtown area, the bands that were playing there, all of them had a boss who was not a musician. So getting paid was easier than in a band, a very successful band where the leader was also a musician, a singer. It is hard to control that kind of income. Now, when you say downtown, you are talking about where all the big hotels and offices are? You're not talking about Matonge where all the rumba nightclubs are. Matonge was not part of downtown. Matonge was, and is, still part of the rest of the city. Downtown is like where you get the business area of Kinshasa. Downtown is where people go every morning to work, or every morning to do their shopping. And the bands that playing there, are they playing in hotels? No. There were clubs. Real clubs. Dance clubs. Places like… I will give you an example. The first time I played in a club in the United States was at the Savoy on New York, on 46th [Street]. Places like that, you have them in Kinshasa, where people come only to listen to music or to dance and drink something. There were also hotels downtown, the Okapi Hotel, the Memling Hotel. Oh yes. Memling. I remember that one. But the clubs had a bigger audience for bands than the hotels. Because the people came from everywhere. “Let's go listen to American music, the latest songs from America, Great Britain, from France.” So every morning the musicians who played in those places had to look for what is new from America. What is new from Europe. And they practiced that music. The first band I led, that’s what they were doing. So you have this meeting with Tabu Ley and he’s trying to get you to leave all that behind and join his band. What happened? We ended by understanding each other. I gave my conditions. We agreed, and then I decided to join Afrisa International. The same day, I began rehearsing with the band, and from that time to the time of Tabu Ley passing away, I never left his band. Even if he went back home, he knew that the band was in America with Modero. When you first joined in 1970, this was the beginning of Afrisa, right? Yes. The very beginning. I think that was the first month or the second month that the name of Afrisa was there. It moved from African Fiesta to Afrisa. When the name was still African Fiesta, Tabu Ley started with some partners. African Fiesta came after they had left African Jazz, because African Jazz belonged to Kabasele. There were three associates: Dr. Nico, Kabasele, and then there one who was like a manager, Roger Izeidi. He was not a singer, but he played maracas, and he was a very influential person. But in the course of time, Dr. Nico left. That left only the two of them. I think after Dr. Nico left, five years later, Tabu Ley and Roger broke up. So the name still belonged to the two of them. He did not want to keep the name, because one day, the other guy could come and say, “Well, it's still our band, even if I'm not there. It's the same business. 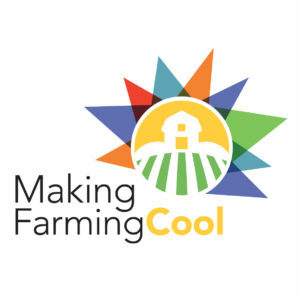 I am part of it." So he decided to change the name to show people in the business that he was no longer associated with anybody. He was by himself. He was his own leader, and from that time, he was the only person making decisions for his band. What was different in the sound of Afrisa? Tabu Ley was the main song and music writer. He knew what he wanted the music to be. That was Tabu Ley’s style. It had some of the same accents from African Jazz, maybe 20 years before, but improved. The lyrics were mostly based on one major voice, and Tabu Ley’s vocal was higher pitched than most of the regular singers in the Congolese music. It's very remarkable. Wasn't Afrisa the first Congolese band to use trap drums? Yes. O.K., you see how the salsa music plays? You almost don't have a drum. You have congas and timbales. That's the way Congolese music was. The stage was exactly as it was for Latin music. No drums like in jazz music. Then it was Tabu Ley who introduced the drums. And that was a big change. A big change. And the other particular thing about Tabu Ley’s music was a lot of horn arrangements. The taste was to get the horns into that music. If you play Tabu Ley’s music without the horns, that becomes a small band. So, always the horns, the drum set, the trumpets and everything. People used to give more respect to a band with horns than without horns. People knew what they wanted Saturday night, Friday night. They don't go to a music where you have just a singer, or singers and guitars. That doesn't attract anybody. The most appealing band should have a horn section. But now even in the early recordings, I'm thinking of Franco's recordings from the '50s, there were horns, but usually just one or two. And it was sort of this idea that we have different approaches to the style, but people need both of us. In 1974, you played for the Rumble in the Jungle, right? The big fight in Kinshasa between Muhammed Ali and George Foreman. I was one of the guys working with the commission. They wanted some people who could speak English, in order to speak to the artists, and especially the press who came to Kinshasa. And also, they wanted some of the well-known bands to be part of the festival in Zaire. Because so many American musicians came. People like BB King was there. The Pointer Sisters were there. Even the Latin group Fania All-Stars. They were all there. James Brown. Exactly. Lloyd Price. So many people that I knew, they were out there and so they wanted some good Congolese bands too. So the choice was Afrisa International, Franco, Trio Madjesi, and some lady singers like Abeti. So for the biggest of the shows before the fight, after James Brown, they put us. That's the one you have on the Internet. The first picture that comes up is me with my saxophone. That must've been a great experience. Is this the film When We Were Kings? O.K. Let’s talk about the first time you came to the United States. In ‘84. We stepped into New York on January 12, 1984, and we went straight to D.C.
Because that's where there were a lot of Africans, people who knew Congolese music. Yes. In D.C., the Africans were like diplomats who knew about the concert because of the advertisements. And there were some Americans too. They didn't really know it. No. But they wanted to understand what it was. The guy was making the publicity was an American. Paul Trautman. Yes, he was one of the first to tour African bands here. So what came next? Well, we went on tour, almost 33 states. I was counting, because I was still a manager. 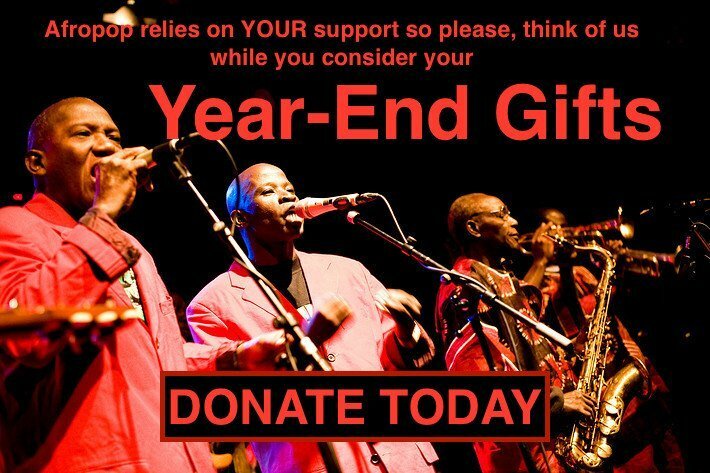 And then we spent almost from January… We left in April and went to continue another tour in West Africa. That is interesting. I didn't realize you guys had been here that early. I don't think very many Americans knew much about this music then. We played in a couple of universities, in New Hampshire, in Boston. From there, we went straight to Dallas and Austin. Then we went to San Diego University and then UCLA. Then Portland, Oregon, Seattle, Vancouver, B.C. In Vancouver we had two performances in the same night in the same place. They were two or three times more audience than the room itself. Wow. So this is all in 1984. How long was it before you came back after that? I think it was 1989. O.K., so this is after Graceland. Our show had gone on the air the year before. Did you notice a difference in the audiences then? I noticed one thing. The group was more well-known. Better known than in ‘84. But there were less performances in the schedule, because that was not Paul Trautman anymore. That time it was two different people. First there was the initial guy in the East Coast. He was a guy was working with Kilimanjaro in D.C. Raymond Paris was the one who was setting the shows. He had worked with Paul Trautman, so he knew who to contact. After that, we spent more time in Los Angeles. The guy who brought us to Los Angeles was from Sierra Leone. He was a fan of Tabu Ley so he put his money to get Tabu Ley a tour of the West Coast. And this time you played San Francisco. You know, there was quite an African music scene there at the time, mostly from Nigeria, Ghana and South Africa. I think that the audience in San Francisco was discovering something new: Tabu Ley with his band from the Congo. Let's listen to it. That audience had more attention to listen to the music. Hugh Masekela was there. I think it was that night. Because I have known Hugh Masekela for more than 40 years. He’s a guy I've seen all the time in different places here in America. Whenever we went, he was always there. So let's go ahead to the time when you guys came to live in the United States. The first step, we as a band spent four or six months in Los Angeles in 1990. We did not really want to live there, but we were looking for where to go, we did not want to go back to the Congo, to Zaire. So we started making contacts, but then we returned to Europe. We came back in ‘93 and decided it was more interesting to promote our music in America than to go sit in France where you play maybe one concert every three months in Paris. America was more interesting, so we had to make a decision. And me, I met with one guy who seemed very interested in promoting us. That was David Gaar. So this is the period of time when you made Exil-Ley and those records for Rounder Records, like Muzina. Also that live session for Real World records. That was a very active period. We never knew about Rounder Records. David Gaar is the one who made that contact. And this is the time still that records were being sold well. Then we get to the late '90s, and the big changes in Congo, Mobutu is gone. And this is when Tabu Ley becomes involved in government. So he was not happy with what I told him. It was still in his mind that even if he left Afrisa, there was no problem because I was there. For me, he did not succeed in politics. He was a singer. He was not a politician. For Tabu Ley’s life, that was a failure, and I told him that. I told him when I went to Kinshasa. I told the TV and the radio when they interviewed me. I said, “Well, I was not happy with Tabu Ley coming to do the politics. That was not his field. And I think it was a failure.” Everybody agreed with me. He never really went back to singing in a big way after that, did he? He was sometimes doing from time to time, he was back into singing, going to the stage with different musicians. But he did not want to re-create his band over there. Because for him, his band was in America. Each time he had a guitarist, or a group of three or four guitarists, he wanted to do something, to sing something. That's why he went sometimes to sing in Angola. He went to sing in Paris, in Brussels, but he did not want to use his Afrisa name, because for him Afrisa was bigger than politics, going to sing two or three songs. So he was doing something. And then he suffered a stroke. Yes, I think the stroke was due to… I don't know, maybe due to some local circumstances that even doctors never told us about. Because one of the doctors who is treating him I knew very well. He never told people what happened. But he did have a stroke. I think he had a lot of discomfort with the politics he was doing. Maybe that was there. Maybe he was thinking about why did he leave the band behind. And he looked back at the time he lost when he went to the politics. Those must be some of the reasons that led to his stroke. What was the point when he told you he wanted you to keep the band going? Maybe 10 months before he died. He called me here in my home. He had his girls there; all of his daughters had come. He said, “Can you call Modero?” So she called and said, "Daddy wants to speak with you." She handed him the phone, and he said, "Modero, what has happened? Why don't you call me? Why? Are you angry with me?" He said, "Well, drop that. I want you to come and talk with me. I am going to Kinshasa." He was already at the hospital in Brussels. He said, "I want you to go with me to Kinshasa, and I want to talk to you." I said, "O.K., well, going to Kinshasa is costing a lot. But if you want to talk to me, I want to be there." He said, "Don't worry about it. I'm going to send you a ticket, and we are going to meet within five or six days in Kinshasa. Because they want to give me an award. A medal or something like that. I want you to be there. It's an event for me. You must be there.” So he sent me a ticket. It was a long trip to Kinshasa. I went to meet with him. He wanted some people to be witnesses to what he was going to tell me. He said, "Modero, as you see what I look like today, I will never jump onto any stage anymore. I will not sing any more for the audience, but I can still write songs. But I will not sing anymore. So you're the only one who was been with me the longest path. I want to not to drop Afrisa. Can you promise me to keep this band going ahead? Promise me. I want people here to listen.” There were so many people there, some of the officials. "O.K.,” I said, "Well, O.K., I promise." After we talked that day, a few days later, I returned here, and he also returned to Europe. And he called me again. He said, "Are you still thinking about what we said in Kinshasa?" I said yes. He asked, "Who are the people who are going to be with you?" 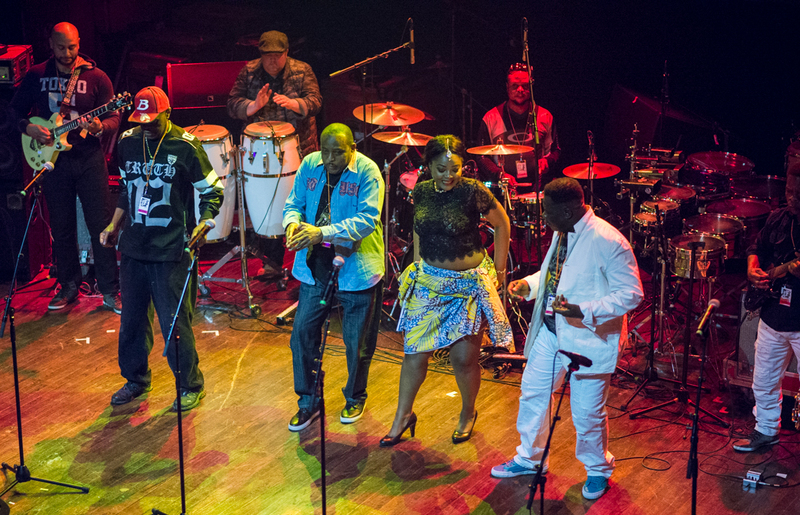 The reunited Afrisa performing at globalFest 2017. Photo by Banning Eyre. Wawali Bonane: I said, "We are good." He said, “Don’t leave Modero aside. We can try to work together." And then later on, he went back home and still called and kept talking to us about this project, about what Afrisa is today. So then, a year or so later, Tabu Ley is gone, and you are working on this project. Tell us about the recording process. I am curious to know which songs you picked, and why. This is an important record--the rebirth of Afrisa. Tell me about the musicians, and then about the songs you picked. Modero: Well, the person I talked most to is Wawali, and also Dino in Paris. We know that Tabu Ley is the creator of the band. This is Tabu Ley’s music. If you want the people to trust us, you have to do the music the way we were doing it with Tabu Ley. Let's choose a couple of songs that we can put into the recording that people will recognize. We decided to take one song from the '60s. We took the song “Micheline.” “Micheline” was written when it was still African Fiesta, but it was also a big success with Afrisa. We also took “Karibou Ya Bintou,” a song he sang for one of the dancers who died accidentally, one of the Afrisa dancers. They were called the Rocherettes. And then, there is a song that is half-modern half-traditional. That's “Kaful Mayay.” That song is sung in Lingala, and some of the lyrics are in Kiyansi, which is Tabu Ley’s dialect. That was a successful song. Wawali: “Kaful Mayay” is like somebody doesn't know you. Like you know Jon Kertzer? No, I don't know Jon Kertzer. If you want to know me well, go ask Jon Kertzer. You are referred to somebody. This is me, Rochereau. If you want to know me, go ask Mayay. He knows me very well. Modero: We also took a song that he sang for one of his girlfriends who became his second, or third, or fourth wife. “Melanie.” And the song was known as “Mela.” A beautiful woman from Brazzaville. He had two children with her. She is still there. She is the lady that supported Tabu Ley during his illness. That woman was always next to Tabu Ley. That's why we as a band said that was something we can do, to think about that woman who helped Tabu Ley when he was ill. That's why we took the song “Mela” or “Melanie,” and that is also the title of the album. Then we chose “Tu As Dit Que,” a very successful song with a good dance rhythm. Wawali is singing that song. We took most of the songs from the ‘70s. One maybe in the ‘80s. And the last successful song that Tabu Ley recorded with Afrisa before he went back for politics is “Muzina.” Wawali did suggest that one of the songs could be my composition. And so one of the songs is mine. “Ma Fille,” my daughter. You're recording this record here in Seattle, and you brought people from L.A., including the lead guitarist Huit Kilos. Huit Kilos came. He is in California. And we had also the drummer Parigo Asuka. He came. And Djeffard is one of the singers from the East Coast. Djeffard Lukombo. He came from Atlanta, Georgia. 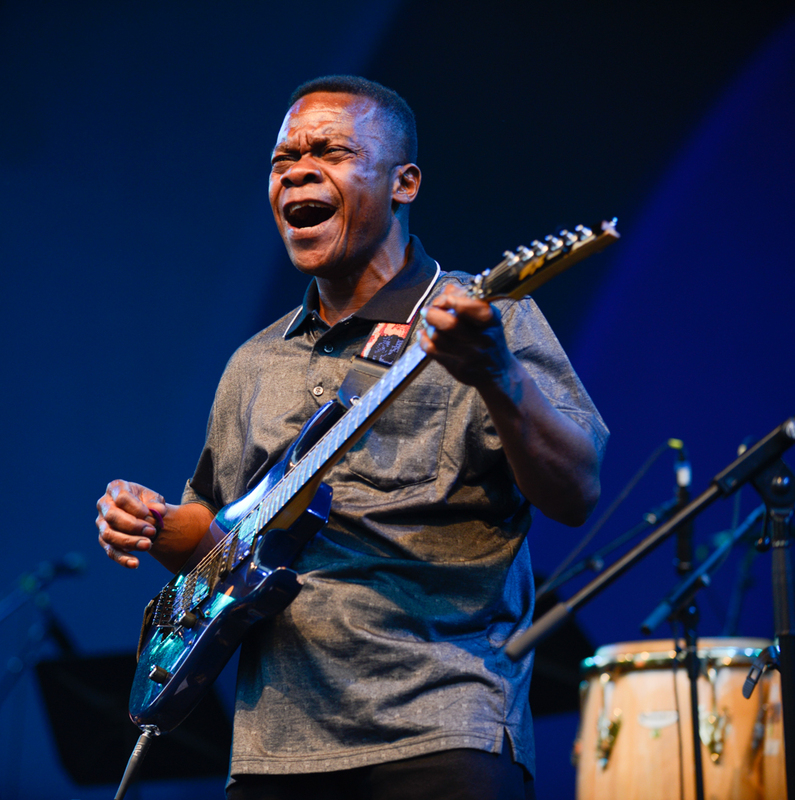 Huit Kilos on stage with Afrisa at globalFest 2017. Photo by Banning Eyre. And did you have some guys from Paris too? The guys in Paris are like Dino Vangu, the solo guitar, plays on some of the songs. The tracks were sent to him, to the studio. We did also call on two or three American guys. One is backing me on the saxophone, and another is playing trombone. When you listen to two or three of the tracks there, there is a real accent of trombone. I insisted to have the trombone. And there will be one lady singer who will sing a song with the male singers. I think that's it. That's a lot of musicians. But somebody has to assume the role of Tabu Ley, right? I insisted to have people who have been in Afrisa longer, like Wawali, to sing most of Tabu Ley’s songs. Because I would like to maintain Tabu Ley’s accent into the music. So I did appreciate that Wawali could do it. And I wanted him to do it. So when this record comes out, you will tour, right? That's what we are working on, we don't want to drop this music. We want the band to do differently from what other people have done when the leader is no longer there, they don't want to do it. That will not happen to Afrisa. We will continue, and we will take this music to Africa, to the Congo, and to anywhere else, and then we will come back to America. This is our place. We will stay here. But the music will be going everywhere. Wow. Well, we wish you all the best of luck with that. Thanks so much for speaking with us. Photos of Afrisa International's appearance at globalFest 2017 can be viewed here. Feature image by Banning Eyre. For reportage on Tabu Ley Rochereau's 1984 appearance in Los Angeles, see this "Best of The Beat on Afropop" feature.